2 player cooperative play. The player must "give" the ball to the other player to continue play. Every time the player receives the ball, the paddle grows. When a player gives the ball, the ball grows, increasing play time. 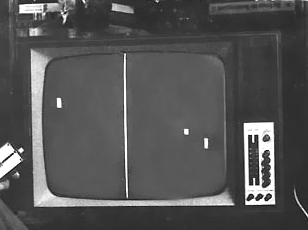 Play ends when the player’s paddle shrinks to nothing. Encourage mutually beneficial, co-dependent play (charity). The players rely on each other to continue play by providing the other player with the means for participation. Like charity, the player must accept and give. A game built in Proccessing. Serve the ball with [s] or [left arrow] and return it to the player. The computer will mitigate. If you served the ball you can preserve it by hitting it. If you were served the ball, collect it to increase the everyone's score.